A new mixed-use development will be directly in the sight lines of motorists approaching Miami’s South Beach via the MacArthur Causeway. The project will occupy a 1.58-acre site where the highway from the mainland joins the barrier island. 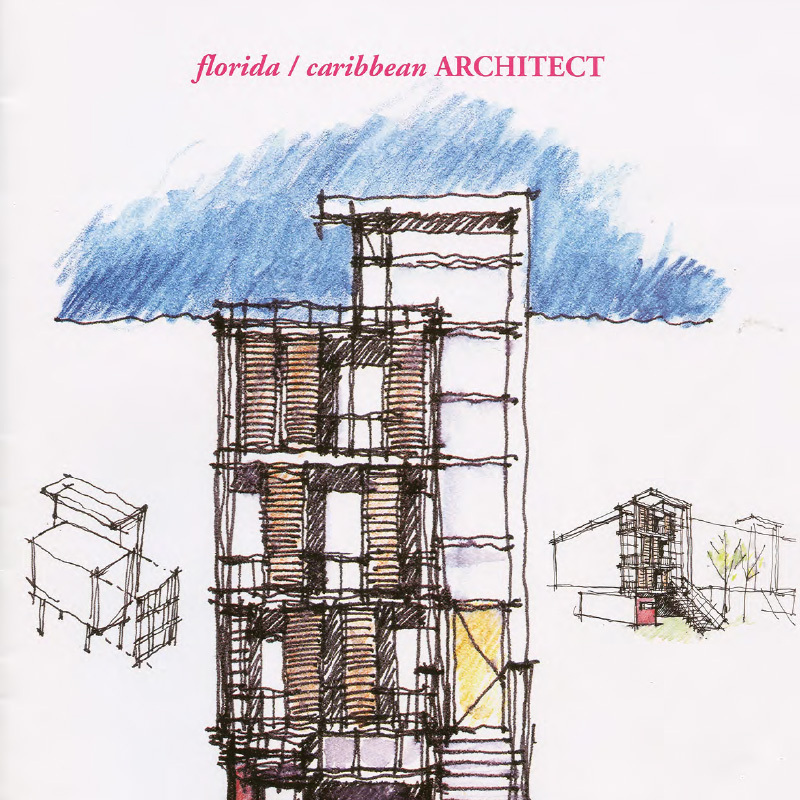 The aesthetic burden of creating a de facto gateway to the hippest part of Miami Beach was the challenge faced by architects Carlos Prio-Touzet, AIA, and Jacqueline Gonzalez- Touzet, principals and founders of the Miami-based Touzet Studio. According to the architects, since the building is approached in motion, it was designed to be experienced in the round like a piece of sculpture. In fact, the building’s glass surface changes color with the changing light, hence its name which is derived from the Latin root for glass. Mindful of its role within the urban fabric, Vitri was designed to enrich the neighborhood without overwhelming it. The design concept splits 66 residential units between two buildings: a curving, faceted form that faces Biscayne Bay for views of the water and downtown Miami and an urban-oriented rectangular volume that relates to the scale of traditional Miami Beach neighborhoods. The rounded four-story volume facing the bay was inspired by the natural environment of water and sky. Here, the curving concrete frame encloses glass-fronted “facets.” In the double-height units, the glass walls curve outward to capture views, in an expression of wind and waves. The building’s urban elevation respects the existing fabric of the city, utilizing steel, glass and concrete for a frankly man-made, modernist aesthetic. The irregular grid pattern on the façade, combined with a gradual shift in the tint of the glass walls, is meant to reinforce the sense of motion. The ground level retail area is encased in a wood and glass struc-ture designed to accommodate a signature restaurant and service-oriented boutiques. The resin-impregnated wood, a material successfully used in Europe, was chosen to reinforce the tie-in to nature. Wood elements were also used to soften the approach to the hidden, four-level parking garage that will serve both retail customers and residents. Twenty-two penthouses will each include an enclosed “sky garden” formed by the upper portion of 28- foot glass walls that extend well above the roofline. The partially covered terraces in this rooftop “lantern” will shelter summer kitchens and wet bars for entertaining. Owners will have the option of adding private spas from which co view downtown Miami and all of South Beach. In the one, two and three-bed-room residences, interior features include 19-foot ceilings in glass- walled living/dining rooms. Master bedrooms and baths are sec on mezza- nines that overlook double-height living quarters below. Textures and colors represent those found in nature and they are balanced with the clean lines and smooth surfaces of steel, concrete and frosted glass. Each master bath opens onto a balcony that is designed to serve as a lounging space off the master bedroom. Project Credits: Touzet Design Studio: Architect; Steven Feller, P.E., Inc.: MEP Engineer; Pistorino & Alam: Structural Engineer; Langan Engineering: Geotechnical Engineer; Consul Tech: Civil Engineer; Raymond Jungles: Landscape Architect; Leviev Boymelgreen: Developer.